This article considers recent developments in antibiotic therapy and how simple changes to a course of antibiotics given in specific environments can reduce antimicrobial resistance. Short courses of antibiotics can be effective, but need close and careful monitoring, which in the past has proved difficult outside the hospital environment. New telemonitoring technology can help remotely observe the condition of the patient taking the short course and report any abnormalities back to medical professionals. A rapid emrgence of multidrug-resistant (MDR) bacteria strains is occurring worldwide, compromising the efficacy of antibiotics, which have been saving millions of lives (1). Indeed, decades after the first use of antibiotic treatments on patients, bacterial infections have again become a threat (2), due to antimicrobial overuse and misuse, as well as a stalling in new drug development in the pharmaceutical industry. Antibiotic-resistant infections are already widespread across the globe (3). In 2011, the IDSA (Infectious Disease Society of America) Emerging Infections Network found in a national survey that more than 60% of participants had seen a drug-resistant untreatable bacterial infection within the prior year (2). Most public health organizations have been warning the medical community about the rapid emergence of resistant bacteria, which was described as a “crisis” or “nightmare scenario” that could have “catastrophic consequences” (4). In 2013, the CDC (Center for Diseases Control and Prevention) declared the world to be in a “post-antibiotic era,” and in 2014, the World Health Organization (WHO) stated that the antibiotic resistance crisis was becoming highly dangerous (5). MDR bacteria have been declared an important threat to United States public health and national security by its medical institutions (3). The CDC has classified a number of bacteria depending on their threat levels (urgent, serious, or concerning), most of them being already responsible for considerable clinical and financial burdens on the healthcare system, patients, and their families (3, 6–8). Among those pathogens, resistant Staphylococcus aureus and Enterococcus species are currently involved in a global pandemic and are posing the biggest threat. Vancomycin-resistant enterococci (VRE) and a growing number of other pathogens are also developing resistance to many common antibiotics. The spread of drug resistance among common respiratory pathogens, such as Streptococcus pneumoniae and Mycobacterium tuberculosis, is similarly epidemic. Furthermore, Gram-negative pathogens are particularly worrisome. They seem to become resistant to nearly all the antibiotic drug options presently available, creating situations similar to the pre-antibiotic era. The emergence of MDR Gram-negative bacilli is affecting every field of medicine. The most severe Gram-negative infections are usually caused by Enterobacteriaceae (commonly Klebsiella pneumoniae), Pseudomonas aeruginosa, and Acinetobacter spp. Those pathogens are also increasingly found in the community, for instance, extended-spectrum beta-lactamase (ESBL)-producing Escherichia coli and Neisseria gonorrhoeae. The rise of antimicrobial resistance (AMR) has a negative impact on the control of bacterial infections in terms of treatment strategy and length of hospitalization. In Europe, the burden of AMR has been estimated at 25,000 deaths, a mean difference of 2.5 extra days of hospital stay for patients, and an overall cost of approximately 1.5 billion euros per year (9). In France, it has resulted in an estimated number of 158,000 infections (127,000 to 245,000), including almost 16,000 invasive infections (bacteremia, meningitis), and 12,500 deaths per year (10). Also, compared to other European countries, France bears an additional antibiotic cost burden of 441 million euros (11). Hence, coordinated efforts to implement new policies, renew research efforts, and pursue steps to manage the crisis are needed (2, 12). Reducing the unnecessary use of antibiotics is one of the key measures to slow the progression of AMR and make our current available drugs last longer. A number of initiatives have shown that reducing the resistance is within reach of health policies. In Finland, their national policy of reduction of macrolides prescriptions lowered the incidence rate of erythromycin-resistant Streptococcus pyogenes from 16.5% in 1992 to 8.6 % in 1996 (13). In Iceland, a nationwide plan for antimicrobial prescriptions led to a reduction in incidence of Streptococcus pneumoniae with lower susceptibility to penicillin from 19% in 1993 to 14 % in 1998 (14). In France, a 26.5% decrease of antibiotic prescriptions between 2002 and 2007 (15) coincided with a 50% decrease in the incidence rate of S. pneumoniae, with lower susceptibility to penicillin (16). In this context, decreasing exposure to antibiotic treatment with shortened treatment durations would hugely help fighting AMR by lowering antibiotic selective pressure on the patients’ endogenous flora, thereby preventing the selection of resistant strains and acquisition of new resistance mechanisms (17–19). Moreover, shorter treatment durations would have other benefits (20). First, it allows a better compliance from patients (adults or children) (21, 22). It has been shown that, in the case of respiratory tract infections (RTI), a bad compliance could be associated with therapeutic failures and an increased morbidity (23). Furthermore, prolonged treatment duration tends to increase the incidence, duration and gravity of adverse events caused by antibiotic treatments, especially diarrhoea or Clostridium difficile infections (19). Finally, it would reduce hospital costs, primarily those arising from the length of stay (24, 25), and overall antibiotic consumption (11). Antibiotics are mostly prescribed in outpatient medicine (90% of overall consumption, being 125 million units a year) (26). In the community setting, mean antibiotic treatment duration is 9.2 days, and the median is 6 days (26, 27). In France, in the community setting, RTI are responsible for seven prescriptions out of 10 (26). In the United States, these infections also represent the main cause for adult antibiotic prescription in the community (28). Therefore, reducing the duration of antibiotic prescriptions in these cases is a priority and would have a large impact. To this day, optimal treatment duration for community-acquired pneumonia (CAP) is not well documented. Recent studies have suggested that CAP can be successfully treated by a short course antibiotic regimen if a clinical response is rapidly obtained (Table 1). Even though this strategy was widely implemented in the early days of penicillin, with 24 hours of treatment (29), El Moussaoui et al. were the first to demonstrate by a comparative randomized study that treatment by amoxicillin (1.5g/day) can be safely stopped in hospitalized patients with mild to moderate-severe CAP responding to treatment, after only three days of therapy (30). A recent trial by Uranga et al. showed that antibiotic treatment empirically chosen by physicians in four teaching hospitals in Spain could be safely stopped after five days in hospitalized patients presenting stability criteria for 48 hours (31). Of note, in this study, most patients were afebrile at diagnosis, which probably reflects a large proportion of viral infections or bronchitis. Moreover, the preferred treatment was fluoroquinolone, which is not in accordance with French and United States guidelines. Clinical response can be defined as reaching IDSA stability criteria that are easy to collect in clinical practice, and are associated with excellent prognosis (32). These criteria are obtained in three to four days in half of the cases (33, 34). But, it is variable among hospitalized patients with CAP, as it requires more than seven days in 8% of the cases (34–38). This suggests that “one duration does not fit all”. Therefore, it is tempting to evaluate an individualized duration of therapy adapted on the patient’s clinical response. Such a treatment approach would help to ensure bacterial eradication while avoiding unnecessary antibiotic exposure and reducing antibiotic resistance. A demonstration of this approach in outpatients would be practice-changing as it would allow it to be applied to all patients with a CAP diagnosis instead of only half of them. As RTIs constitute a major indication of antibiotic therapy in outpatients, a multicentre randomized clinical trial could be considered to assess whether an individualized antibiotic treatment duration strategy based on patient’s clinical response for CAP in community settings is as effective as conventional treatment duration. To date, no clinical trial has been conducted evaluating an individualized duration of therapy in CAP as pointed out in a recent editorial in JAMA (39). And to our knowledge, no study concerning duration of antibiotic ever took place in a community setting. With our trial, we hypothesize that 24 hours of stability in patients with febrile CAP, having received at least three days of treatment, should be enough before stopping antimicrobial treatment as suggested by data of our ongoing trial (40), and therefore reduces the duration of therapy compared to usual practice. If treatment duration can safely be based on clinical response, this could allow treating CAP for a mean of three to four days versus the usual seven to 10 days. As there are 500,000 CAP annually in France, this strategy could lead to preventing from 1.5 to 3.5 million days of unnecessary antibiotic exposure each year in our country. Such a study necessitates that clinical response can be reliably monitored in outpatients. New connected electronic devices make this a possibility, as our study using MyHealthBox® devices by Visiomed demonstrated. Indeed, connected electronic devices can collect reliable data on patients’ symptoms evolution, determine when patients reach stability criteria, and help prevent treatment interruption in patients who do not meet stability criteria. This is important in daily practice: patients cannot be monitored permanently by physicians or nurses, whereas electronic devices allow a precise and daily follow-up. • Many data are available on the use of connected devices for healthcare that assess security and liability. • Connected devices to monitor acute diseases in the community seem promising but have never been evaluated before to the best of our knowledge. Mobile technology offers ways to help with healthcare access, follow-up and safety management of patients (affordability and quality). Through mobile health applications sensors, medical devices and remote patient monitoring products, there are avenues through which healthcare delivery can be improved. Connected devices allow a precise and daily follow-up of patients which cannot be allowed by physicians in daily practice. These technologies can help lower costs by facilitating the delivery of care, and connecting people to their healthcare providers. Applications allow both patients and providers to have access to reference materials, lab tests and medical records using mobile devices. These applications empower patients and health providers proactively to address medical conditions, through near real-time monitoring and treatment, no matter the location of the patient or health provider. The benefit of management of chronic disease with mobile technology has been well demonstrated for heart failure (41, 42). Data on monitoring of acute conditions are currently rather scarce. In practice, connected electronic devices could allow the patient to self-monitor body temperature, blood pressure, respiratory rate, heart rate, and oxygen saturation to assess safety. These data could be transmitted to a secure server and an intermediation platform accessible to a coordinating team as well as a medical team. This team should be composed of medical and paramedical staff, to monitor patients and allow assistance 24 hours a day/ seven days a week. They should be able to call the patient to evaluate his/her status, and send an emergency medical team when needed. This close monitoring will prevent potential undetected failure in patients staying at their home and quickly prompt a new consultation and/or treatment in case of aggravation. Dr Aurélien Dinh, MSc, MD, is an infectious diseases specialist. He works in the Infectious Diseases and Tropical Medicine Department at Raymond Poincaré Teaching Hospital (Versailles Saint-Quentin University) in Garches, France. He graduated in Medicine in 2006 and specialized in infectious diseases in 2010. Dr Dinh is a PhD student and is also part of the French Infectious Diseases Society and the regional antimicrobial stewardship group. He is involved in several national clinical research programmes, funded by the French government, focusing on reducing antimicrobial treatment duration during vertebral osteomyelitis, acute pyelonephritis and, currently, community-acquired pneumonia. Clara Duran, MSc, obtained her Master’s degree in Applied Microbiology from the Pierre and Marie Curie University (UPMC) of Paris in 2011. In 2013, she completed a Clinical Research Associate (CRA) training in Leonard de Vinci Institute. Since 2014, she has been employed as a CRA in the Infectious Diseases and Tropical Medicine Department at Raymond Poincaré Teaching Hospital (Versailles Saint-Quentin University) in Garches, France. She is currently working on studies focusing on respiratory tract infections and antibiotic treatment durations. Dr Francois Teboul, MD, has been an emergency doctor since 2007 from the Necker Enfants Malades, Paris V Faculty. He studied in the CERTO Molecular Biology lab between 2005 and 2006. 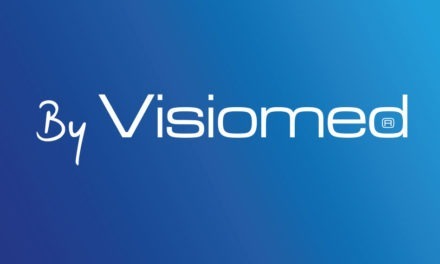 After creating an Electronic Medical Record dedicated to the Emergency Room between 2008 and 2012, he joined Visiomed in 2013 to develop BewellConnect and the Telehealth activities of Visiomed. 2. Spellberg B, Gilbert DN. The future of antibiotics and resistance: a tribute to a career of leadership by John Bartlett. Clin Infect Dis. 2014;59 Suppl 2:S71–5. 3. Golkar Z, Bagasra O, Pace DG. Bacteriophage therapy: a potential solution for the antibiotic resistance crisis. J Infect Dev Ctries. 2014;8(2):129–36. 4. Viswanathan VK. Off-label abuse of antibiotics by bacteria. Gut Microbes. 2014;5(1):3–4. 5. Michael CA, Dominey-Howes D, Labbate M. The antimicrobial resistance crisis: causes, consequences, and management. Front Public Heal. 2014;2:145. 7. Lushniak BD. Antibiotic resistance: a public health crisis. Public Health Rep. 129(4):314–6. 8. Rossolini GM, Arena F, Pecile P, Pollini S. Update on the antibiotic resistance crisis. Curr Opin Pharmacol. 2014;18:56–60. 12. Gould IM, Bal AM. New antibiotic agents in the pipeline and how they can help overcome microbial resistance. Virulence. 2013;4(2):185–91. 13. Seppälä H, Klaukka T, Vuopio-Varkila J, Muotiala A, Helenius H, Lager K, et al. The effect of changes in the consumption of macrolide antibiotics on erythromycin resistance in group A streptococci in Finland. Finnish Study Group for Antimicrobial Resistance. N Engl J Med. 1997;337(7):441–6. 14. Livermore DM. Bacterial resistance: origins, epidemiology, and impact. Clin Infect Dis. 2003;36(Suppl 1):S11–23. 15. Sabuncu E, David J, Bernède-Bauduin C, Pépin S, Leroy M, Boëlle P-Y, et al. Significant Reduction of Antibiotic Use in the Community after a Nationwide Campaign in France, 2002–2007. PLoS Med. 2009;6(6):e1000084. 17. File TM. Clinical efficacy of newer agents in short-duration therapy for community-acquired pneumonia. Clin Infect Dis. 2004;39 Suppl 3:S159–64. 18. Guillemot D, Carbon C, Balkau B, Geslin P, Lecoeur H, Vauzelle-Kervroëdan F, et al. Low dosage and long treatment duration of beta-lactam: risk factors for carriage of penicillin-resistant Streptococcus pneumoniae. JAMA. 1998;279(5):365–70. 19. Ball P, Baquero F, Cars O, File T, Garau J, Klugman K, et al. Antibiotic therapy of community respiratory tract infections: strategies for optimal outcomes and minimized resistance emergence. J Antimicrob Chemother. 2002;49(1):31–40. 20. Kolditz M, Halank M, Höffken G. Short-course antimicrobial therapy for community-acquired pneumonia. Treat Respir Med. 2005;4(4):231–9. 21. Reyes H, Guiscafre H, Muñoz O, Perez-Cuevas R, Martinez H, Gutierrez G. Antibiotic noncompliance and waste in upper respiratory infections and acute diarrhea. J Clin Epidemiol. 1997;50(11):1297–304. 22. Hoppe JE, Blumenstock G, Grotz W, Selbmann HK. Compliance of German pediatric patients with oral antibiotic therapy: results of a nationwide survey. Pediatr Infect Dis J. 1999;18(12):1085–91. 23. Kardas P. Patient compliance with antibiotic treatment for respiratory tract infections. J Antimicrob Chemother. 2002;49(6):897–903. 24. Niederman MS, McCombs JS, Unger AN, Kumar A, Popovian R. The cost of treating community-acquired pneumonia. Clin Ther. 1998;20(4):820–37. 25. Fine MJ, Pratt HM, Obrosky D, Lave JR, McIntosh LJ, Singer DE, et al. Relation between length of hospital stay and costs of care for patients with community-acquired pneumonia. Am J Med. 2000;109(5):378–85. 27. Jones BE, Sauer B, Jones MM, Campo J, Damal K, He T, et al. Variation in Outpatient Antibiotic Prescribing for Acute Respiratory Infections in the Veteran Population: A Cross-sectional Study. Ann Intern Med. 2015;163(2):73–80. 28. Shapiro DJ, Hicks LA, Pavia AT, Hersh AL. Antibiotic prescribing for adults in ambulatory care in the USA, 2007-09. J Antimicrob Chemother. 2014;69(1):234–40. 29. Kirby WM, Turck M, Fleming PC, Hamburger M, Louria DB, Nelsen JD. Round table: optimal duration of antibiotic therapy in severe bacterial infections. Antimicrob Agents Chemother. 1967;7:183–202. 30. el Moussaoui R, de Borgie CAJM, van den Broek P, Hustinx WN, Bresser P, van den Berk GEL, et al. Effectiveness of discontinuing antibiotic treatment after three days versus eight days in mild to moderate-severe community acquired pneumonia: randomised, double blind study. BMJ. 2006;332(7554):1355. 32. Mandell LA, Wunderink RG, Anzueto A, Bartlett JG, Campbell GD, Dean NC, et al. Infectious Diseases Society of America/American Thoracic Society consensus guidelines on the management of community-acquired pneumonia in adults. Clin Infect Dis. 2007;44 Suppl 2:S27-72. 34. Menéndez R, Torres A, Rodríguez de Castro F, Zalacaín R, Aspa J, Martín Villasclaras JJ, et al. Reaching stability in community-acquired pneumonia: the effects of the severity of disease, treatment, and the characteristics of patients. Clin Infect Dis. 2004;39(12):1783–90. 35. Blasi F, Ostermann H, Racketa J, Medina J, McBride K, Garau J, et al. Early versus later response to treatment in patients with community-acquired pneumonia: analysis of the REACH study. Respir Res. 2014;15:6. 36. Garin N, Genné D, Carballo S, Chuard C, Eich G, Hugli O, et al. β-Lactam monotherapy vs β-lactam-macrolide combination treatment in moderately severe community-acquired pneumonia: a randomized noninferiority trial. JAMA Intern Med. 2014;174(12):1894–901. 37. Hopstaken RM, Coenen S, Butler CC, Nelemans P, Muris JWM, Rinkens PELM, et al. Prognostic factors and clinical outcome in acute lower respiratory tract infections: a prospective study in general practice. Fam Pract. 2006;23(5):512–9. 38. Hopstaken RM, Butler CC, Muris JWM, Knottnerus JA, Kester ADM, Rinkens PELM, et al. Do clinical findings in lower respiratory tract infection help general practitioners prescribe antibiotics appropriately? An observational cohort study in general practice. Fam Pract. 2006;23(2):180–7. 40. Dinh A, Duran C, Davido B, Lagrange A, Grenet J, Bouchand F, et al. Can we treat community acquired pneumonia among hospitalized patients with comorbidities with only 3 days of beta lactam? In: 26th ECCMID (9-12 April 2016). Amsterdam; 2016. 41. Antonicelli R, Testarmata P, Spazzafumo L, Gagliardi C, Bilo G, Valentini M, et al. Impact of telemonitoring at home on the management of elderly patients with congestive heart failure. J Telemed Telecare. 2008;14(6):300–5. 42. Chaudhry SI, Mattera JA, Curtis JP, Spertus JA, Herrin J, Lin Z, et al. Telemonitoring in Patients with Heart Failure. N Engl J Med. 2010;363(24):2301–9. 43. Li JZ, Winston LG, Moore DH, Bent S. Efficacy of short-course antibiotic regimens for community-acquired pneumonia: a meta-analysis. Am J Med. 2007;120(9):783–90. 44. Chastre J, Wolff M, Fagon J-Y, Chevret S, Thomas F, Wermert D, et al. Comparison of 8 vs 15 Days of Antibiotic Therapy for Ventilator-Associated Pneumonia in Adults. JAMA. 2003;290(19):2588. 45. Agarwal G, Awasthi S, Kabra SK, Kaul A, Singhi S, Walter SD. 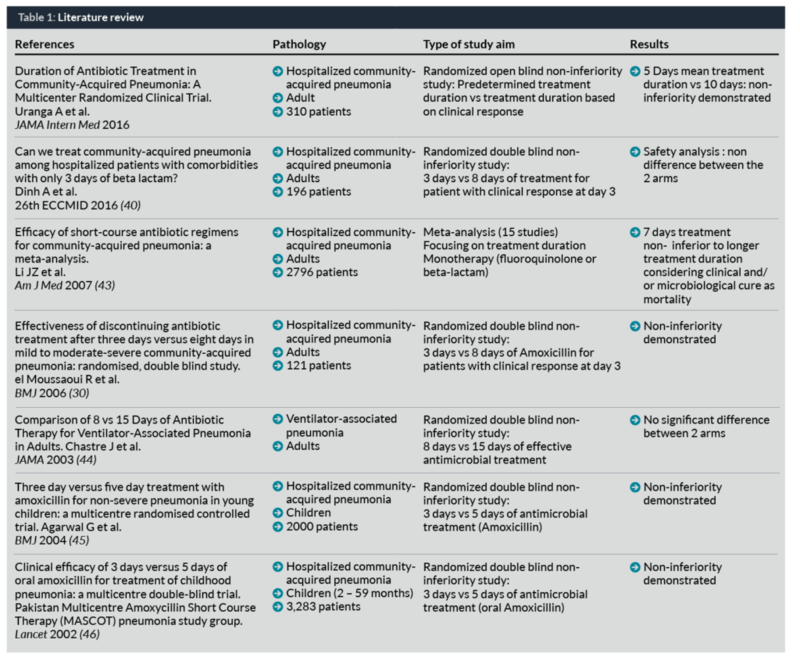 Three day versus five day treatment with amoxicillin for non-severe pneumonia in young children: a multicentre randomised controlled trial. BMJ. 2004;328(7443):791. 46. Pakistan Multicentre Amoxycillin Short Course Therapy (MASCOT) pneumonia study group. Clinical efficacy of 3 days versus 5 days of oral amoxicillin for treatment of childhood pneumonia: a multicentre double-blind trial. Lancet. 2002;360(9336):835–41. Less than one cent to save a patient from AMR?